One of the challenges facing LMS administrators and L&D Professionals is driving regular use and engagement of the platform. Despite a need for continuous learning the LMS is often only visited infrequently by users to complete mandatory learning and formal courses. You make a substantial investment in a Learning Platform. If people are only visiting it occasionally, and only because they have to, we’d suggest you’re not getting a sufficient return on that investment. So what will drive users to your learning platform on a regular basis? We suggest that part of the answer lies in looking at the sites we use every day, and why we use them. Before we look at Learning Management Systems and platforms, let’s think about why users regularly visit websites. What is it about the sites you visit most frequently? For me personally, the sites I visit most often provide updated information which I find helpful and relevant. Things change and I want to stay updated. Some of the most regularly visited sites on the web are weather sites and news sites. These sites are also constantly updated with new information. When it comes to news there may be common themes but there are different stories every day. To stay updated you need to check the news regularly. Equally knowing the weather forecast yesterday does not help you today (something we have learnt from experience in England). At work to stay updated I check my Slack channels regularly, to see what my colleagues are sharing and questions they are asking. I check our financial performance every week using a tool called Baremetrics which shows me our sales so far this month, the churn and other relevant data. I also keep an eye on my competitors’ sites regularly to check what they are doing. These platforms are addictive – in a good way. Put simply: I use these sites and platforms because I want to, not because I have to. They keep me more informed and more productive. To use a term from Tomasz Tunguz, they’ve earned a “share of habit”. I would find it hard to go a day without checking them. How does this compare to your experience? Is it similar? What share of habit does your LMS have for your audiences? Could it increase what share it has? So what can we learn from our own experience with engaging sites and platforms, and apply to LMS platforms? When we reflect on why people visit sites regularly it is clear that updated news, content or relevant information are key factors. We all need to stay on top of trending information. We don’t want to be the last person to find out what’s happening in our sectors, our clients, or our competitors. But how often is your LMS content updated? Monthly, weekly, daily, hourly? Formal courses are valuable and play a key part in building initial skills and knowledge, but they don’t address the need learners have for continuous learning and staying updated. Ideally your LMS should enable people to continuously learn and develop every day. It should provide updated relevant content alongside the formal learning to support continuous learning. People do this for themselves anyway, though we all have different sources and routines, and we’re not always efficient when we go searching. So why not make it easier for your audience and make continuously updated content a key part of the LMS you’ve invested in? Keeping updated means looking outside the organisation. Not single organisation has a monopoly on new ideas. The reality is new ideas, new products, case studies and industry developments come from outside your business. Thus to stay updated we all need to have access to external content. So people are looking beyond the course already. But that time spent looking is not always productive. How do we know what we need to know? We can’t read the thousands of articles published daily even in narrow and niche topics. How do you know what to search for? Google is not enough. Search for “Leadership” and you get 325 million results. Not particularly helpful for the time-pressed leader. Which sites should you visit to stay updated? This may be dozens of sites from LinkedIn, to industry sites to competitor websites, bloggers, analyst reports. Thus even in well defined niches, we all suffer from what Mark Schaefer calls “Content Shock”: There’s too much content and too little time to consume it all. Ideally what we need is a filtered daily briefing that provides relevant, updated content from thousands of sources. There is no way you can manually curate all of the content being published. There is simply too much content. Consider that in December 2017 there were over 40,000 articles a week being published on Bitcoin. It probably went up (or down) in price 20% while you were scanning them. However, what you can do is let machines do the filtering for you: Set up intelligent filters that search across all sources or just a set of defined sources to filter the content you need based on things such as keywords and ranked by site authority, social engagement, recency or other metrics. This filtered content can be delivered to your learning platform using APIs. Below is a simple example of a filtered briefing (collection of updating articles) set up in Anders Pink on Employee Engagement. This briefing on Employee Engagement uses a number of simple filters. The sources are limited to a list of 6,000 business websites. 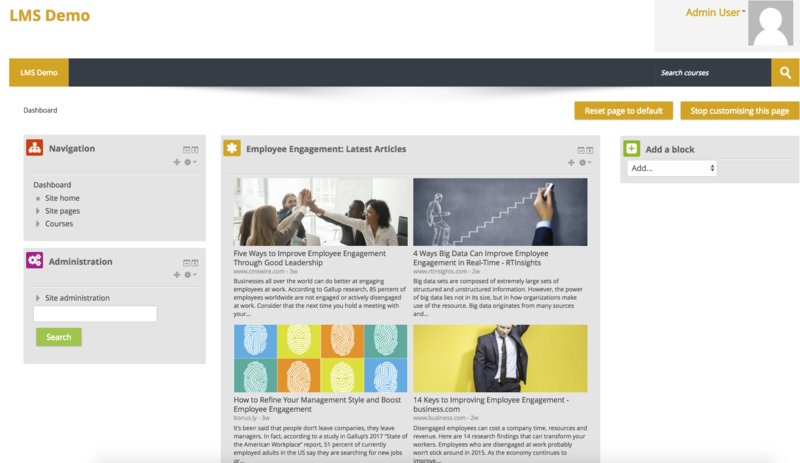 Articles with employee engagement or staff engagement in the title are filtered from these 6,000 sites each day. 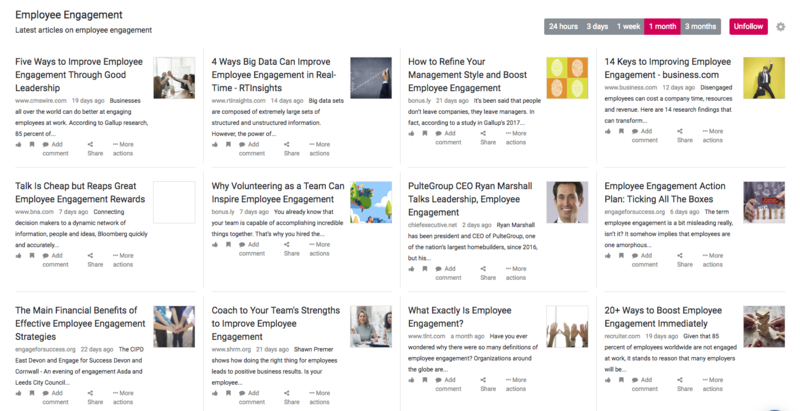 Articles with the words product or software also in the title are removed, as we don’t want to see content for example that is launching new employee engagement software. You can filter briefings whatever way you want. So instead of checking 20 different sites each day, put them all in one briefing and let it do the searching for you. In our example we then use the Anders Pink API to display this content in our Moodle LMS alongside formal course materials. For example, in the middle column below. The great benefit of using an automated filter and an API to display content inside a learning platform is that it delivers updated relevant content to learners every day. They don’t have to go back to another platform to find it. You don’t have to keep looking for new content to keep it fresh. There’s no SSO. Just click on a link to see the article. It provides useful content, seamlessly integrated, that will help your audience stay updated and which will encourage the to visit the platform on a regular basis. 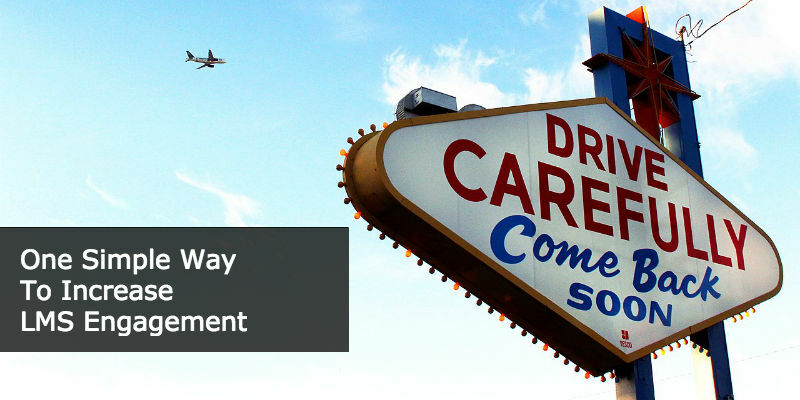 Bringing external content to into your LMS is not the whole answer for driving more engagement and usage. But it’s one simple step to make your Learning Platform that bit more addictive. And it’s even easier if you automate it with an API.